Your Best Desserts Served Up Here! 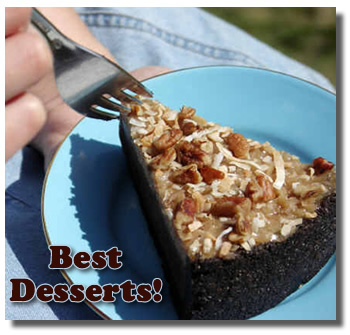 Your Best Desserts And Ours! Let's compile the Best Desserts from all over the world all in one place, cakes, cookies, chocolate dessert recipes and more. From simple desserts to those that take special attention to assemble, we love sweets! Sometimes people think Chocolate Candy Mall is only about chocolate candy. That may have been true when we first started the site several years ago, but we've grown! Now we include ideas for chocolate and dessert and recipes to die for - all kinds, both yours and ours. We already have places across the site for visitors like you to add your favorite candy recipes, fudge recipes, brownie recipes, and more. But now we want to create an obvious location for you to add your favorite dessert recipes that don't seem to fit in other categories. My sister has 9 children (lucky girl!) and is always creating clever birthday cakes for them each year. I've talked her into sharing some of those adorable cakes with us, so you can use the ideas, too. Have you made a clever cake or some beautifully iced cupcakes? Don't be shy! We'd love to see them. Include the decorating details so we can duplicate your efforts. Maybe you ate out at a fancy restaurant and enjoyed the best dessert ever, but you don't actually have the recipe. No worries! Grab a couple of photos with your cell phone and tell us all about the experience. We're happy to have your dessert reviews, too. Perhaps you attended a birthday party or special event and just loved the creative theme and/or delicious desserts. Take a few moments and share them here. I look forward to reading and experimenting with the ideas you share and adding my own favorite desserts as I indulge, too. If you're looking for a simple dessert or a party idea, read some of the submissions made by other visitors to get your creative juices flowing. Have A Cake, Cookie, Or Dessert Idea To Share? We are always on the lookout for more cake, cookie, and dessert recipes and party ideas to add to the site. If you've made something special, or even enjoyed it somewhere else, don't be stingy, share it with the rest of us! Do you have any pictures of your cake, cookies, or dessert idea to add? Great! Click the button and find it on your computer. Then select it.